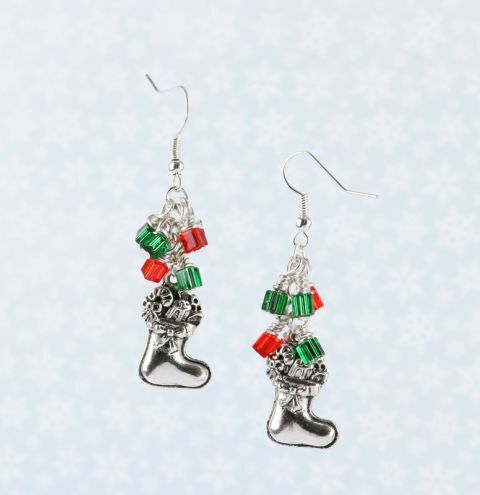 Make a pair of festive earrings for the holiday season! For each earring, you will need six of the green cube beads and six of the red. Thread a single bead onto a headpin and create a wrapped loop. Repeat this step for all six of the beads. Link five jumprings onto an earwire and attach the bottom one onto the stocking charm. From the top, open the first jumpring and attach a two green and red bead. Open the third jumpring and attach a red and green bead. On the fourth jumpring attach a red and green bead. Repeat the steps to make your second earring.